By my count, only three players have transferred into the Big Sky this offseason, with 2 of those 3 heading to Eastern Washington under first year coach Jim Hayford. One of the players is big man Martin Seiferth, who is transferring from the University of Oregon. He is 6'10'' and originally from Berlin, Germany. He will have 3 years of eligibility remaining after his redshirt year, which makes it an especially nice get for the new coach. "We believe he can develop into a top big man in the Big Sky Conference," said Hayford. "He brings great athleticism and quickness to go with his height, and has put on 20 pounds of muscle since coming to the U.S. last fall. We have three senior post players in the program, so this will allow us to have one of their replacements step in with familiarity to the program. We are very pleased that he chose us out of all the options he was presented." Seifarth had minimal impact as a freshman, appearing in only 12 games and playing roughly 4 minutes per game. In his final club season in Germany he scored 13 points per game and added 7 rebounds. He is only 220 pounds, so the transfer year could be huge for him to build strength. If he is able to put in a full year in the weight room, he will be a nice asset for the Eagles, especially with his size. 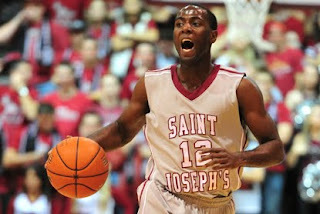 The other transfer is guard Justin Crongsile, who will be coming to the Eagles from St. Joseph's. He played two years for St. Joe's, even starting 19 games as a freshman. He was ranked 24th best PG in the nation after his senior year, so he comes with potential and talent. Crogsile had a promising freshman season, but really struggled in his sophomore campaign. He shot 31% from the field (38% from 2s, 28% from 3s), and had very mediocre assist and turnover rates. For all of his talent, his true shooting percentage was very mediocre, and he struggled to find minutes on a bad team. Still, it is a nice pickup for Hayford because Crogsile's pedigree shows he has the talent. A year off and a change of scenery could be exactly what he needs to become a more efficient, consistent player. Of the two transfers, Crogsile had a higher risk, but certainly a higher reward. It will certainly be interesting to see what type of role Seifarth and Crogsile have in 2012-2013. One thing is sure - even with the transfer of Glen Dean, Eastern Washington fans have to be excited about what they have seen from Jim Hayford so far in his brief tenure.